Many people cringe when they think about going to couples counseling. There’s a myth that you only go to couples therapy if something is wrong. Premarital counseling can be an especially helpful tool for preventing problems in your relationship. Why wait until there’s an issue when you can keep issues small and manageable with therapy? Premarital counseling provides couples with the tools to build a strong foundation for a healthy relationship. Marriage changes things in your relationship. It can bring up a lot of issues that you may not have dealt with before as a couple. In premarital counseling, you can anticipate, predict, and plan for those issues before you get married. By doing so, you’ll have a realistic sense of what to expect from your marriage. More importantly, you will learn the skills to work through problems while things are still positive in the relationship. Just because you’re planning to get married soon doesn’t necessarily mean you don’t have relationship issues that can be addressed now. Many couples find themselves struggling during the time prior to marriage. The pressure of planning a wedding alone can create stress in the relationship. Therefore, you might first address immediate issues in premarital counseling. For example, what disagreements do you have about the wedding? Do you both wholeheartedly want to move ahead or do one (or both) of you have some ambivalence? Maybe there is just one nagging thing that is holding you back from setting a date. Premarital counseling can help you address these common concerns. You may already be aware of potential issues. Counseling gives you tools to work through them. Additionally, a therapist specializing in premarital counseling can help you think about things that you might not yet realize could be a problem in your relationship. Premarital counseling isn’t just about identifying a problem and fixing it. Instead, it’s about learning how to be in a healthy relationship with one another. This begins with communication. If you can learn to communicate about difficult topics, then you are well on your way to handling the many stressors that will arise in your marriage over the years. Learning to do this now, before the two of you have established too many negative communication patterns, can make those issues much easier to navigate. One thing you might practice in premarital counseling sessions is putting your marriage first. You can learn how to view problems as enemies of the relationship. In other words, arguments won’t be about who “wins” but rather about how to find a solution or compromise that is best for the relationship. Premarital counseling is an investment in your relationship now and in the years to come. Attending sessions with your partner indicates how much you value your relationship and want to start your married life together with skills and tools to be sure your marriage remains strong through the years ahead. Lauren Thomas Hale, MA, LPC Intern, works with premarital couples at the Relationship Counseling Center of Austin as they prepare for their upcoming wedding. Lauren guides couples by giving them any communication and conflict-resolution tools they may need as they embark on the next leg of their relationship journey. If you and your partner want to prepare to tackle any hurdles married life may throw your way, call Lauren at (512) 270-4883, ext. 114, or request an appointment with her on the RCC Austin Scheduling page. While effective communication may come easily for some, it is far more difficult for others. Does it seem that communicating with others is increasingly difficult and disrespectful? Do your disagreements feel less like interacting and more like overreacting? Are your rants making their way into your everyday conversations more and more? You’re not alone. Communication can be tough for many of us, especially when our emotions take over. Communication is often complex because the way information is shared varies from person to person, depending on a variety of factors. The unique nature of our relationships, our family of origin, our pasts, our circumstances, our communication styles, as well as our emotional needs, impact how we communicate. Moreover, a lot of this happens under the surface, in split seconds, without our awareness. And maybe, too often, adversely affects what we say and how we say it. Learning to be a more effective, compassionate, and respectful communicator might be one of the best investments you make in yourself. Finding ways to tune into your own issues and needs while employing proven, effective communication tools is vital. You can fulfill your need to be heard and understood while capably influencing and engaging the people in your life. Effective communication is a two-way street; you can’t be a good communicator by insisting on being the only one speaking. You need to find a happy medium of give and take in a conversation. Finding a way to really tune in is crucial because listening demonstrates respect and self-control. It honors the other person’s point of view and their right to speak without being dismissed, interrupted, or shut down. However, be aware, active listening is not quietly waiting to speak. Active listening is not simply hearing the other person’s words. Active listening is not formulating your response while the other person talks. It means ensuring you understand the message the other person is trying to relay. Active listening involves hearing the import of what is being communicated to you, asking questions for clarity (not debate), summarizing what you think they mean, and asking if you have the correct understanding before responding with your own thoughts. What you don’t say is just as important as what you do, so it’s important that your actions and behaviors match your words. Try to establish rapport and connection with your body. Lean in, look at the person speaking in an interested and open manner, relax your body, nod in understanding. Avoid rolling your eyes, shrugging, and folding your arms. These communicate disrespect, disinterest, or even disdain. Communication is meant to connect not create distance. Be careful to show that you want to do more than make your own point. Signal that you are willing to be fully present and engaged physically and mentally. Effective communicators are responsive rather than reactive. Take charge of the way you behave and reply to others. Don’t allow someone else’s differing, offensive, defensive, or divisive position to determine your ability to communicate well. You own your responses and you are responsible for your reactions. When you practice self-control and mindful awareness you can slow down the temptation to react without thinking. If you’re feeling attacked or overwhelmed, it’s okay to take a step back from the conversation and temper your response with introspection. Then, reconvene when you feel emotionally grounded and able to hear and share effectively. When you state your needs, it’s crucial to be as straightforward as possible. Do your best to leave little room for interpretation so that the other person thoroughly understands your intentions. If you’re having a difficult conversation, it can be intimidating to state your needs with this much vulnerability. However, misunderstanding can keep you and your conversation partner from ensuring your needs are met and impede vulnerability in future interactions. Just as you would want the whole truth when you’re listening, do all you can to present the full picture when you’re speaking. It’s not your responsibility to agree with everything that’s presented to you in a conversation. Conflict happens. You and your friend, sibling, parent, spouse, co-worker, etc. won’t always see eye-to-eye. That is totally okay. Instead of agreeing with the facts, try relating to the feelings. For instance, you don’t have to sanction their conclusions, but you should try to understand the feelings and emotions. You don’t have to agree with the position of your partner, family, friends, or co-workers, but simply try to understand and voice compassion. You may share similar feelings of concern with the topic being discussed. Start there. The factors contributing to your opinions don’t have to be agreed upon, but normal, human feelings can provide common ground. Effective communication is vital for a happier, more connected life. If you don’t feel confident in the way you communicate with others, you can take steps that can lead to more effective communication skills. Read books or watch videos on effective communication and improving listening skills. Join a group that works to improve speaking and leadership skills. Or, seek guidance from a professional who can help you uncover your communication weaknesses and support you as you learn new tools and skills for effective communication in all your relationships. 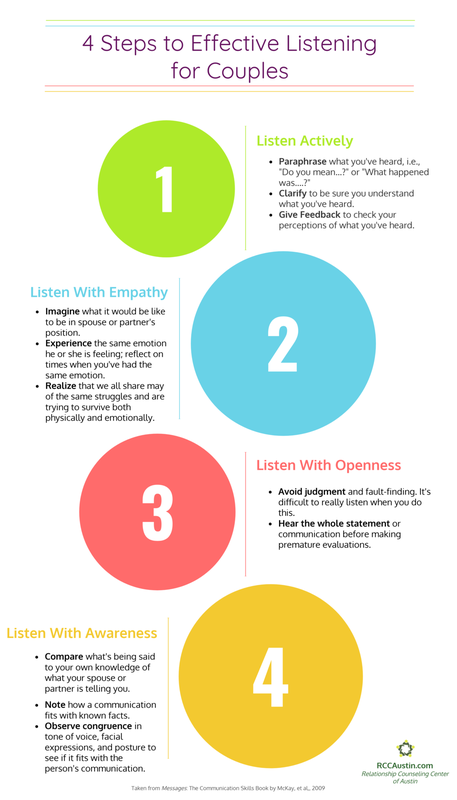 Effective listening is an important skill for couples to learn. Try these four tips for improved communication. Financial disagreements are a major stressor for romantic relationships. Studies have indicated that a large majority of couples report that money causes tension in their relationship. Other research shows that approximately one-third of couples have even said that financial concerns are their biggest stressor. Financial disagreements may be inevitable, but they don’t have to be the cause of a ruined relationship. It’s important that both you and your partner learn how to prevent money problems from destroying your connection. Money may be a factor in ending a relationship, but it’s a topic that many people love to avoid. The subject of money, especially in the beginning of a relationship, can be tricky. This isn’t something you need to dive into on your first date, but it’s important to have a real conversation about finances sooner rather than later. Instead of sweeping financial differences under the rug, acknowledge the fact that they exist. Remember that honesty is the best policy – discuss any potential problems that are on the horizon instead of keeping them a secret. The more you discuss your finances, the less stressful the conversation becomes. If you and your partner frequently argue about finances, take a step back and look at the bigger picture. Are finances really the problem? Or is it just a cover-up for what lies underneath? For instance, many people with financial disagreements have come to realize they are experiencing a power or commitment struggle. Maybe you’re saving up to buy a new home together, but you’re doing the bulk of the saving while your partner is frivolously spending. Dig deep and discover whether the actual problem stems from money or the fact that you’re worried you may be more emotionally invested in the relationship than they are. Money and finances have different meanings to different people. Explore with your partner what money means to you. Does it mean security? Does it indicate success? Is there shame around your thoughts and beliefs around money? Have an open and honest discussion with your partner about your philosophies about money. Conquer the actual source of money concerns before you tackle finances together. Most people in a relationship say that they have different spending and saving habits from their partners. Whether it’s due to the way you were raised, your priorities, or your personality, chances are, you handle finances differently than your partner. When it comes to money and relationships, more often than not, you’re both going to need to work together toward compromise in order to find common ground. If you want to open the financial lines of communication with your partner, it’s important to maintain a judgment-free zone. If your partner is having financial difficulties, face the matter honestly but try not to bombard them with, “I can’t believe you would spend THIS much money on THAT,” or “How could you let yourself get into so much debt?” Chances are, they feel enough guilt and shame already, and judgment only adds to those emotions. Instead of berating your partner, set clear goals together and work on a cooperative plan to improve and resolve the financial situation. Be a safe person for your partner to be open and honest about their financial matters. You and your partner may have a joint bank account, but it’s important to remember that you’re still separate people. You have different needs, interests, goals, enjoyments, etc. Review your accounts and investments, decide on a certain amount of money that you both can spend on yourself each month. This money can be spent on clothes, spa days, cooking classes, golf lessons, camping gear, or whatever you desire. Budgeting this money for mutual or individual enjoyment can act as a release valve on money stress. Just a little discretionary money for each of you, just for enjoyment, can help to keep all the saving and budgeting you do more palatable and less prone to resentment. Most of all, don’t let financial disagreements get in the way of a happy relationship with your partner. Maintain a strong relationship by acknowledging your financial problems before they grow out of control. Work together and your union will be all the better for it. Mirela Bitkowski, MA, LPC Intern, sees couples and individuals at the Relationship Counseling Center of Austin. For more help on navigating financial strain in your relationship, contact Mirela at (512) 270-4883, ext. 103, or request an appointment with her on the RCC Austin Scheduling page. An engagement is one of the biggest and most exciting steps any relationship can make. But oftentimes people get so wrapped up in the wedding planning, they forget about the marriage planning. Many people are hesitant to begin premarital counseling because they don’t have any serious relationship issues at the time. If that’s the case, that’s great! But there are bound to be bumps along the road as your marriage grows. Unless you have specific problems that you and your fiancé want to address, the focus of premarital counseling won’t be on current issues. Instead, attention and awareness will be directed at potential choices, challenges, and problems that might arise down the line. You and your counselor will discuss a wide range of topics, not just your stereotypical counseling subjects. In premarital counseling, many couples find themselves discussing things they never realized could turn into potential challenges in their relationship. In counseling, the conversation centers on the topics you probably don’t discuss on a day-to-day basis. You will dig deeper and talk about the more serious aspects of sustaining a marriage. Premarital counseling allows you to become more vulnerable and open. You’ll become comfortable sharing things in a monitored setting with a neutral person involved. When you practice openness here, you’ll be more inclined to do so at home, as well. This will strengthen the bond you have and open the dynamic of your marriage moving forward. Embarking on a marriage journey together is probably new territory for the both of you. Even if you’ve been married before, premarital counseling can help. You and your partner needn’t navigate these waters alone. It’s very common to feel some fear or anxiety amidst the excitement of your wedding day and marriage. These nervous feelings don’t diminish your eagerness to spend the rest of your life together. In premarital counseling, you and your partner will discuss plans for your future so that you aren’t thrown into your marriage unprepared. You will likely discuss things as big as raising children or blending families, dealing with in-laws, and you’re your philosophies for managing joint finances. Or, topics that are seemingly small, incorporating little tips that are proven ways to keep a marriage happy and healthy. Talking to someone who’s spent time helping couples is a great way to prepare you for your future. Seeking a counselor who specializes in therapy to help couples before and after marriage is an important step. A counseling professional who specializes in working with couples has the professional education, skills, and experience to be aware of potential challenges that may arise in your relationship. A couples counseling specialist is trained to help you be aware of patterns of interaction with your partner, help you to understand ways of talking to each other that are healthy and positive, those ways of discussion or conflict that can be harmful to your relationship, and the research proven traits of couples who are “masters” at a happy union. Every couple is different, and premarital counseling is not a one-size fit all approach. Together, you and your counselor will come up with a game plan and tailor an approach that’s best for you. Of course, love is important, but love isn’t always enough to sustain a relationship. There are many relational skills you may need to acquire to maintain a healthy marriage. You have probably built some of these skills in the natural course of your relationship, but there may be others that need to be further developed. In premarital counseling, you will spend time discussing communication within your relationship – what’s working for you, what isn’t, etc. Proper communication is essential for the success of any relationship; by strengthening this skill, you’re less likely to run into problems down the road. Give yourself, your partner, and your relationship the gift of a few premarital counseling sessions. You will be glad you did! Mirela Bitkowski, MA, LPC Intern, works with premarital couples at the Relationship Counseling Center of Austin. For guidance in preparing for your marriage, contact Mirela at (512) 270-4883, ext. 103, or request an appointment with her on the RCC Austin Scheduling page.